In 1985 at the age of 24, I bought the old homestead property and house that my grandparents lived in with eight children. There were four houses they lived in on old Register Road, this one being the first. In 1986 I went to the board of adjustments and got a permit for a sawmill to help pay for the land. My family owned land surrounding the property so it was fairly easy to get it pushed through. I logged all the swamps around there first and then the sawmill came after. It was difficult to say the least because I have never worked at a sawmill before or even logged. 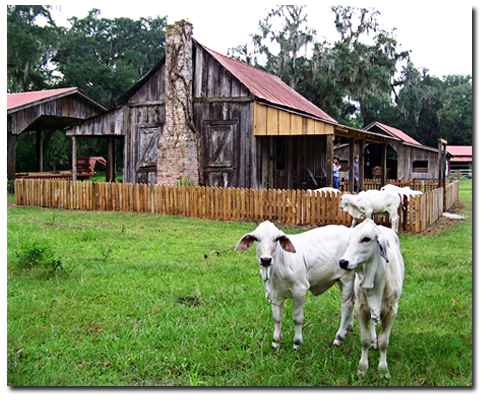 Growing up in Sumter County Florida I use to admire the large Brahman herds of Herman Beville on Highway 301. I became friends with Herman Beeville’s daughter Miss Nellie and tried to purchase some heifers from her. She told me she didn’t sell heifers, but I could call Marcus Shackleford, who had bought a lot of cattle from her father over the years, and I could perhaps buy some from him. In 1993 I met with Marcus and traded him a load of cypress cow pen boards for a couple of his keeper heifers. Also around 1985 I met an artist named Robert Butler. He was painting a boar hog swamp scene at a wild turkey federation show. I remembered his name and years later I would hear about him from time to time. I decided to try to collect a painting or two, and they were hard to come by. After looking for years I have found them in tire stores, insurance offices, government buildings, and hunting cabins on large ranches. I was at a U.S.D.A. Beef Research Station in a meeting room and found one someone had donated. I was also in the famed Army-Navy store in Lakeland, Florida, in the process of acquiring a few paintings five days before it burned down to the ground with over a hundred Butler paintings still inside. The really good paintings are out there but are quite difficult to find.